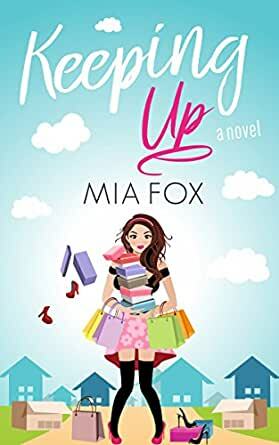 Keeping Up (Hollywood Hotties Book 2) - Kindle edition by Mia Fox. Literature & Fiction Kindle eBooks @ Amazon.com. Keeping up with the Jones’ was never so complicated! Since elementary school days, Katie wanted to be like beautiful, blonde Amanda Exeter, a woman she views with equal amounts disdain and admiration. After years of hoping and wishing, Katie and her husband, Rich, finally move into the same gated community as Amanda. But the moving truck no sooner leaves the driveway of their Beverly Hills abode, when Katie decides something is terribly wrong. The ‘move-in condition’ home now seems obviously void of what the neighbors call essentials -- built-in barbecues, french doors, imported fabrics, and luxury vehicles in the garage. Katie immediately launches a plan to remake herself and Rich as the neighborhood’s newest “It” couple. But her efforts backfire with every hair-brained scheme to climb the social ladder. Fans of Kevin Kwan's "Crazy Rich Asians," Allison Pearson’s “I Don’t Know How She Does It” and Sophie Kinsella’s “Confessions of a Shopaholic” will love this satirical, chick lit comedy. Buy “Keeping Up” and discover that the grass isn’t always greener in a bigger, brighter pasture. Before writing full time, she worked as an entertainment publicist, a career she chronicles in her novel, "Alert the Media." However, she is happy to leave that world behind her, preferring that any drama in her life is only that which she creates for her characters. She lives in Los Angeles with her husband and their three teenagers, along with their "fur children," Bean and Oliver. Let me start by saying this is a very well written book and if social satire is your thing, then this is a good read for you. The characters are exactly as they should be; slap-up-side-the-head worthy. The humor aspect is definitely there, but turns out social satire is not my thing. I still see the value of the lesson it has, and Mia Fox does a good job of making the over-the-top characters and situations they put themselves in seem like they could happen to anyone if they let themselves fall into that trap. I found this book is slow to get going, but hysterically funny when I figured out that it isn't a romance. It's a wonderful jumble of misadventures of a heroine in a "Keeping up with the Jones's" city. 4.0 out of 5 starsMany twists and turns that are at times sad but mainly entertaining. I received a free copy of Keeping Up by Mia Fox and this review was given freely. The story starts out slow, dry and depressing with the novel expressing Emily's life which is filled with envy of others, dissatisfaction with her life, dissatisfaction with her belongings, and for the majority dissatisfaction with her spouse. Emily tries to fit in with the self important and superficial people she feels are "the right crowd" only to experience one embarrassing moment after another. Both the interfering neighbors and Emily and Rich's scheming cause many twists and turns providing a crazy kind of humor that is at times sad but mainly entertaining. This is the first time for anything by Ms Mia Fox and I thoroughly enjoyed this touching story. The characters that the author has given us will keep you wondering what's going to happen to them next,just when we think everything has calmed down something else happens to them. Then when you think you have to story line figured out boom she gets us again. This was a very well written story and as I'm reading about this couple and what they are going through I want to slap them upside the head and the to shake their heads and get the hell out and find a new place to live. Ms Fox seem to make very situations like they could really happen in real life for anyone who lets themselves fall in to this trap of keeping up with the Jones. I could go on and tell you more about this story ,but that would spoil the story for you. I highly recommend that you read this great story ,you won't be disappointed. Mia Fox has done it again. Another awesome book by an awesome author. This is not a typical book by this author but it is a good one. I enjoyed the fact that it wasn't her normal type story but it was an easy and fun read. The characters will keep you wondering where she is taking you next. Just when you think you have the storyline figured out she throws you a curve. But there are no ending cliffhangers. I loved Katie's story. It was a very great book. I want hooked from the beginning.